Don Diego cigars have been around for decades and are known for being mild, aromatic, and inoffensive. The introduction of a Don Diego “Fuerte” is therefore somewhat oxymoronic, bringing to mind George Carlin’s bit about jumbo shrimp. The words “Don Diego” and Fuerte (Spanish for strong) just don’t go together. Unless, that is, you append the words “By Omar Ortez” to the end. 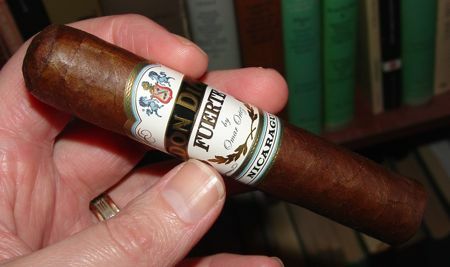 The Don Diego Fuerte is not like some other mild-to-medium bodied cigars that have been fuertified over the years — Indian Tabac “Super Fuerte” and Fonseca “Series F”, for example, which were made a tad bolder but never reached the “fuerte” threshold, in my opinion. The Don Diego Fuerte is not like those cigars. This sucker is FUERTE. There isn’t much information available on the genesis of the blend, or why Altadis decided to exploit a brand name known for mildness to promote a very bold smoke. Aside from its being made in Nicaragua by Omar Ortez, I wasn’t able to dig up too much. 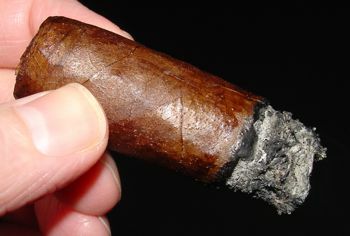 The wrapper for this cigar is a dark and oily Ecuadorian Cubano that I suspect has received processing as a maduro leaf. The binder is Nicaraguan, and the filler is a blend of Nicaraguan and Dominican tobaccos. With the exception of the corona, all of the sizes in the line have a 54 ring gauge. They’re thick sticks. The Don Diego Fuerte has a gorgeously oily maduro wrapper. The roll is dense and consistent, resulting in a perfect draw. The cap is standard for Altadis — nothing fancy, but executed well. The burn is incredibly even for a maduro wrapper, and the ash is solid. With a cigar this short it probably wasn’t necessary to ash it at all, but I did. It starts up like a full-bodied maduro: chocolate with a touch of black pepper, though not as much pepper as many other Nicaraguan cigars. The smoke is thick and the aroma sweet and cedary with a touch of raisin. After a half-inch or so the potency of this cigar becomes evident. It’s smooth, but it means business. Leathery flavors emerge in the middle section, with more spice on the nose than on the palate. There is also an earthy, sulfurous smell at play — something like gunpowder. This blends nicely with the leathery aspect. The last inch brings coffee with an earthy sweet caramel-like aroma. At this point my stomach was churning a bit, so I had to take it slowly. I usually call it a night if a cigar is making me feel green, but I really didn’t want to put this one down. Basically shock, both at the strength and the quality of the cigar. I wasn’t expecting much from the Don Diego Fuerte and based on the paucity of reviews, it looks like nobody else is expecting much either. But clearly Omar Ortez has done something entirely new with a tired old brand. Single stick prices hover around $5 USD for the robusto, or $120 for a 27 count box. Full bodied cigar smokers will have to check out this new formulation. It most definitely is not your father’s Don Diego. I’m really surprised to hear anything good about the last one inch, of a cigar. What with good flavor and aroma, at only $5 USD a stick, with a Final Score of: 90–this sounds not only like a great smoke but also a bargain price! I hear that. I didn’t expect to nub this cigar — I hardly ever nub a cigar — but obviously I was surprised by this one. I think I’m becoming a serious fan of Omar Ortez! The original Don Diego line first came out to match wits with the Macanudo. That was a while back and was always known as a mild smoke. Nothing wrong with that. I agree – I might have to give this cigar a try based on your review! Thanks! Review is right on! A great smoke at a very good price! My new favorite cigar! Your review is spot on. In the midst of smoking my first. I wasn’t too keen on it with the dark brown wrap, but my goodness it is a smooth mild-medium smoke. Thanks for the review! We are the ONLY ONE factory specializing in all kinds of cigar accessories especially the high quality Cigar Cutters and We have been engaging in this line over 15 years. Our products mainly include Cigar Cutter, Cigar Scissors, Cigar Punches, Pipe Knife, Cigar Tube, Cigar Scrapers, Cigar Ashtray, Cigar Hygrometer, Cigar Humidifier, Cigar Case, Cigar Humidors and OEMs. Please enter into our website if you need more information : http://feie.en.alibab.com or you can send me email.